The field of magnetic ultrathin films continues to be an exciting and rapidly expanding one, as demonstrated by recent advances in giant magnetoresistance (GMR), exchange-coupled structures, and magnetic anisotropies. New GMR materials, such as Mn perovskites, have been developed, and new effects, such as exchange coupling through semiconducting interlayers, non-Heisenberg-type coupling, perpendicular GMR, and hot electron spin-valve effects, have been discovered. This book from MRS offers an international perspective on the expanding activity, and features developments in both fundamental and applied areas. 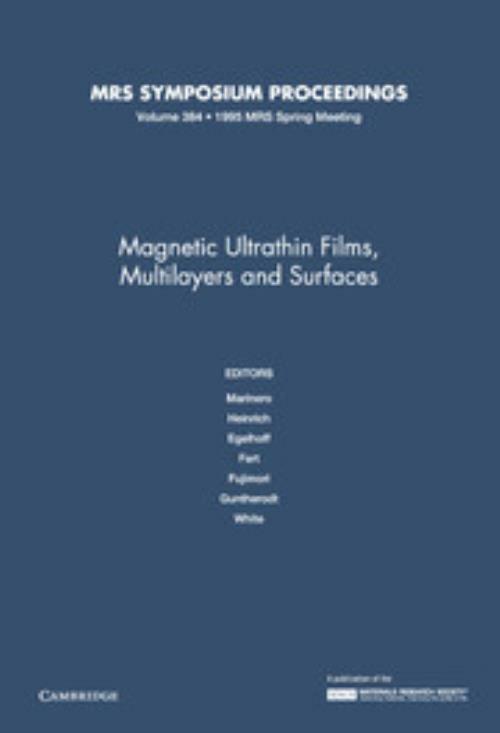 Topics include: novel magnetic nanostructures and applications; growth, structure and interfaces; interlayer coupling; magnetic anisotropy; ultrathin films, magnetic domains; giant magnetoresistance; colossal magnetoresistance; spectroscopies, magneto-optical properties and granular nanostructures. H. Fujimori Tohoku University, Japan. G. Guntherodt Rheinisch-Westfälische Technische Hochschule, Aachen, Germany. W.F. Egelhoff, Jr. National Institute of Standards and Technology, Maryland. E. E. Marinero IBM Almaden Research Center, New York. R. L. White Stanford University, California.